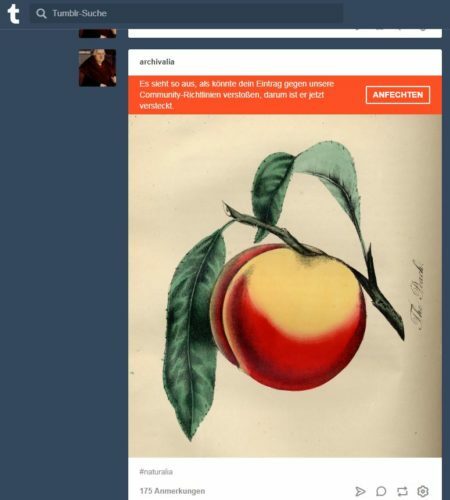 Tumblr ist prüde geworden und duldet keine prallen Äpfel mehr. Neben einigen harmlosen historischen Nackedei-Fotos wurden auch historische Gemälde und Handschriftenillustrationen von Archivalia_EN in dieser Weise in Quarantäne gesteckt. Absurd! Ich fechte mal alle an. Wenige Minuten nach meinem „Appeal“ wurden die Äpfel wieder freigegeben. Fabian Brenker hatte einen Scan angefertigt und die Genehmigung eingeholt. Zum Ansbacher Turnier 1485 sind die bei Pöschko fehlenden Hinweise auf eine Quelle S. 244 Anm. 6 und S. 28 Anm. 9 zu beachten. In https://archivalia.hypotheses.org/6316 als verschollen bezeichnet. They dilute the strengths of Plan S by unnecessarily putting green Open Access at the forefront. „Without a reasonable green OA option, early-career researchers will be torn between the demands of their funders and the demands of their promotion and tenure committees.“ I have no sympathy for that. These people need to change their attitude. Green OA has serious disadvantages. Green OA is OA by the grace of the publisher. From the point of view of the humanities only the version of record is acceptable. Why should publishers accept a free competitive offer to well-paid gold open access if green open access does not have significant disadvantages? „While immediate OA is a laudable goal, the existing language leaves no room for inevitable logistical delays in obtaining and depositing articles.“ This is nonsense. I do not think that any funder will reject deposits with a short delay (1 month or so). Accepted Author Manuscripts (AAM) are available at an early point of the publishing process, and if a Version of Record is allowed funders will likely very happy to wait a short time. If a delay is accepted no funder will ask for the reason of the delay to avoid bureaucracy. One can foresee that It ends with an embargo of 6 months. “including the early view version.” – this refers to publisher’s practice not to author’s preprints. The statement focuses on unimportant details. I have the impression the authors want to intentionally misunderstand the Plan S.
With a career veto nothing but nothing will change at all. Plan S accepts AAMs – no small concession, unfortunately not only for a transitional period. Plan S will immediate OA. MIT and Suber are saying: oh no, not really immediate in all cases. Plan S will libre OA with the default license CC-BY. MIT and Suber are against that. Gold OA is extremely expensive, and the conditions for green, the free alternative, are dictated by the publishers. Green is a ladder that you have to throw away when you reach a new level (Wittgenstein’s ladder).